I heard once, “if their bum is numb, so is their brain”. I don’t know who said it or when (it was a loooooong time ago) but it stuck with me. (My husband just suggested a new saying “if their bum is numb, their brain is dumb” Same idea, anyway.) 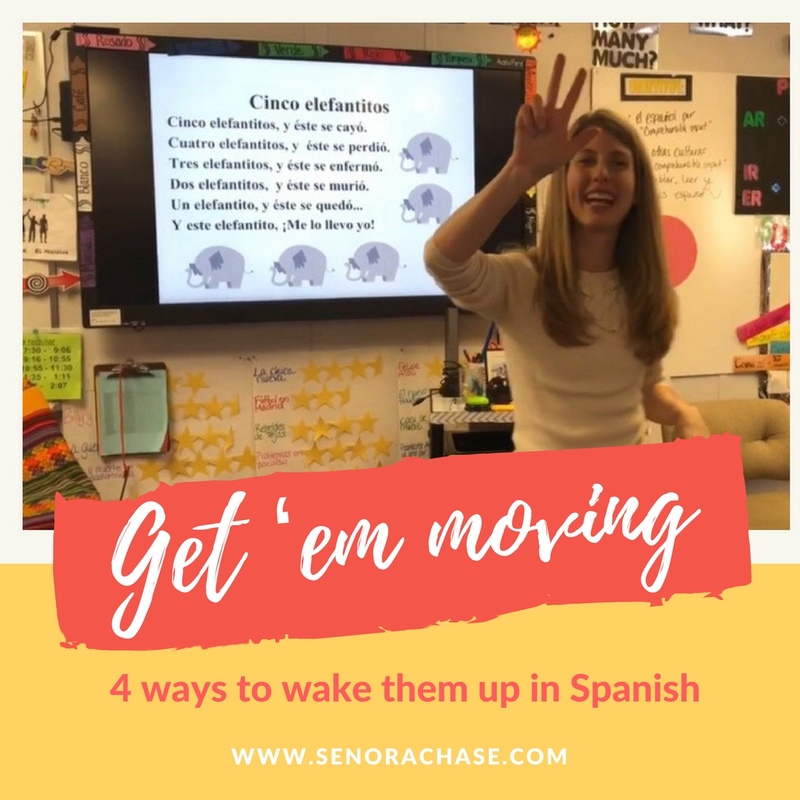 Here are some of my favorite ways to move them around and wake them up! It’s easy and requires no prep at all. (Score!) I usually use this between activities to pep them up. Teacher says Move if you have two sisters….five, four, three, two, one or Move if you’re really tired right now….five, four, three, two, one or Move if you love eating In n Out hamburgers…five, four, three, two, one. You get the picture… Students listen to the statement, and move to an empty chair if it applies to them. Remember to speak slowly and use words they know. I count down from five to one pretty quickly just to add to the general sense of panic and pandemonium. It’s more fun that way. Ba ha ha ha! Here’s a post about it with a video, if you’d like to see it in action! Sometimes I just want to move them around and keep moving with my lesson, so I’ll tell them to take out their Animal Partner Sheet and sit with their kangaroo buddy. Huh? What? Kangaroo buddy? It gets everyone out of their seat, mixes them up, and then we continue with my plan. Number Duel: Students pair up and stand back to back. Both choose a number between 1-5 and hold up that number. They count to three and face each other, showing the other one the number they’re holding up. Then they race each other to add both numbers and say it in Spanish. (So if one student is holding up 2 fingers, and the partner holds up five fingers, they race to say siete). Then they turn around and play again. After they get good at it, I change it tens. So, each finger is worth ten instead of one (so 3 fingers is 30). After they get good at tens, then we play by hundreds (5 fingers is 500). This one is a fun and easy break between activities, or great to fill in the last few minutes before the bell rings. I teach my students a LOT of songs. It’s funny because I have a really awful voice. Really, really bad. Actually, I didn’t know that my colleagues knew that I had such a bad voice (because I only sing in front of my students) until just recently. One of my dear teacher friends commented that she can tell which of her students had my class the year before because they sing off key. You guys: my students sing off key because I teach them songs off key. I can’t help it. It sounds good in my head, honest. When my kids start to get drowsy, my first line of defense is to make them stand and sing. Here are a few of our favorites; I’ve given you the lyrics to project and videos so you can see the motions. (And also because secretly I am hoping become a YouTube singing sensation. Just like Justin Bieber. Well, not just like Justin, but you know). And just to be clear, I didn’t make up any of these! This one is challenging and my high schoolers especially love it. The Amazing and Talented Rita Barrett taught me this one years ago and it’s just so much fun! Remember “Who stole the cookies from the cookie jar?” This is the Spanish equivalent. Lyrics: ¿Quién robó pan en la casa… Video: ¿Quién robó pan en la casa…? I can’t remember where I learned this one; I’ve been teaching it since the dawn of time. It always surprises me how much my high schoolers get into doing juegos de manos, even the boys! I don’t have any videos of my students doing these, but these are the ones I teach my kiddos throughout the year. It works wonders to wake them up, but I avoid these during flu season….all the hand slapping germ swapping….gross…. This is awesome! What great ideas. Thanks for sharing. The number duel was a HUGE hit with my middle school students today! There was so much joy and laughter in the room! Thank you for sharing these great activities! Yes!! We need all the joy and laughter we can get in education today! I just came across your website and LOVE all that you have to share. Thank you for taking the time to compile everything, explain, add photos and in general provide great ideas. Gracias! I love these! Thanks so much for posting! Can’t wait to share them with my high schoolers (including football players). Haha, they’re going to love them!